I've been working with W. Jeffrey Jones on a lot of new designs lately. We have brought back the classic V-90 pickup from a few years back for some of his newest guitars like the Deamon Sassefrax . 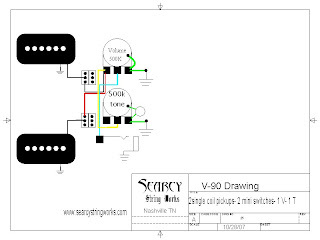 There have been several new P-90 single coil pickups. One of them is the new Tap-90 that features an honest to god old school coil tap. It runs about 8K tapped and about 12.5 K un-tapped. I'm looking forward to seeing these put to use!